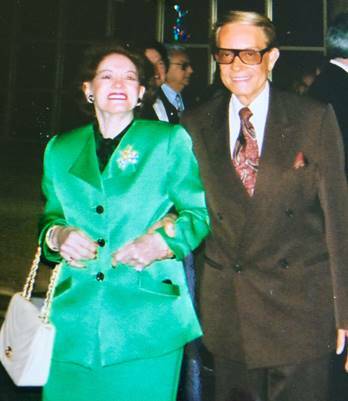 My Foundation reflects a lifelong passion Luisa and I shared supporting the arts and education. In Los Angeles we are avid supporters of the Opera, the Philharmonic and the Ballet at the Music Center. In the town of my birth of Barranquilla, Colombia, we support higher education at some local universities. As I write this, I am deeply saddened not to have my lovely Luisa next to me, sharing the honor of our Foundation together. People are surprised to know that Luisa and I had known each other practically our entire life. In a matter of fact, after fifty-eight years of friendship, I found myself proposing marriage to her. My co-workers had told me for years that she was in love with me and I with her. From the moment we met, Luisa always depended on me, asking me for advice, trusting and respecting my answers. She and I always included one another in social occasions, inviting each other’s friends along, too. Through the years, she and her entire family had become my family. Luisa and her sister Alicia and brother Antonio were always very close. They enjoyed a well lived and a gracious life. Luisa was always there for every person who needed her, but it was her sister who she loved and wanted to please the most. Before Alicia’s death, Alicia made me promise to her that no matter what happened, that I would take good care of Luisa. "Of course" I said, "I love Luisa and will care for her till the day that I die." We were married at Our Lady of Guadalupe in Los Angeles. Our Lady of Guadalupe is the patron saint of Mexico, which was perfect given Luisa’s Mexican heritage. On October twenty-eighth, my friend Marilyn Oliver, the president of the Opera Associates was our witness as we became husband and wife, living together in our home in Hancock Park. I beautifully decorated our home by putting together three collections of furnishings and accessories: those of Luisa, of Alicia and of mine. I am proud and honored to annouce that now our home is now the site of The Rafael & Luisa De Marchena-Huyke Foundation. Rafael and Luisa have travelled the world many times over. In this section we plan to digitize important photos and memories of those trips. To be announced. For the longest time, I have wanted to get out a pen and paper and start writing my story. This is not an easy task when you are not a writer, especially when so much has happened in my life that I want to share. Finally, I began to scribble about my past experiences as accurately as I could remember them, and over ten years, found myself with hundreds of pages of memories—an inventory of the places I’ve visited, the people I’ve met and the family and friends who have shaped my life. Time marches on at a fast pace; time is my worst enemy. This is why I choose to share my stories now. Throughout my many years on earth, people have asked me about my childhood in Barranquilla, Colombia. The answer is easy: I didn’t have one. My soul was rooted in the antique tradition; I already felt like an adult when I was born. In my home, my father never said to us, “You kids go to bed.” We were always included in everything. Though I had many friends my own age, we never seemed to have much in common. I preferred to talk to my parents, and their adult friends and family. At times, this left me feeling a bit isolated. But I knew there was an enormous, exciting world out there, waiting for me to dive right in. My parents helped fuel that dream by taking us all over Colombia— Cartagena, Santa Marta, Bogota, and Medellin. Sometimes we traveled by DC-3 plane. Other trips we took by riverboat—first class journeys that exposed us to different states and their culture, food and craft. Classical music would be played during dinner, and then we’d retreat to a large salon where an orchestra serenaded us with popular music for dancing. We ventured often to Minca, a small town high on the Sierra Nevada, the top of which is crusted with snow most of the year. The two-floor gleaming white Minca Hotel was a beautiful resort. Horses and mules transported us on the surrounding trails so we could witness dramatic falls and swim in pools of water, cold from melted snow. The native flower of Colombia—wild orchids—flourished everywhere, as did vivid green trees, wild flowers, groves of avocadoes and both coffee and banana plantations. This collection of horticulture impregnated the air with an exquisite aroma. Some of the ripest avocados had fallen onto the ground, and as we rode over this carpet of green, our horses mashed the fruit. We didn’t know we were making guacamole, a dish unknown in Colombia at the time. Other than my fascination with maps, another of my favorite pastimes foreshadowed my future. It involved the magazines I’d buy in town, like Screen Romance and Foto Play, which kept me informed about upcoming movies. Over the black and white pictures of movie stars, I’d give complete makeovers on the ladies and the men with colored pencils. I was dazzled by Hollywood, by celebrities and the glamour. Little did I know that I’d someday settle not far from Hollywood, and that my life would be filled with an abundance of glamour and stars. When I finished high school, my father gave me two options: I could go for further study in either the United States or Europe. For me, the choice was easy. The United States of America was where I felt I belonged. I respect one of my favorite gifts of nature, "The Sea"
Donate now to to have 100% of your donation help the Foundation support the arts in Los Angeles and higher education in Barranquilla, Colombia. The Los Angeles Music Center: home of the Dorothy Chancler Pavilion, Ahmanson Theater, Mark Taper Forum, Roy and Edna Disney / CalArts Theatre and the Walt Disney Concert Hall. -Each year the Music Center welcomes more than 1.3 million people to performances by its four internaltionally renowned resident companies: Los Angeles Philharmonic, Los Angeles Opera, Los Angeles Master Chorale, and the Center Theatre Group as well as perfomances by the dance series Glorya Kaufman Presents Dance at The Music Center.